A recipe for sticky toffee pudding is sacred in the kitchen of a discerning cook. Pour 275ml/10fl oz boiling water into a large mixing bowl and add the dates. Stir and set aside until lukewarm. Meanwhile, measure out all the other ingredients for the sponge. Add them to the dates and water and mix together until well combined. Blend the date mixture in a food processor until nearly smooth, but with a few specks of date still visible. Generously butter a baking dish on all surfaces and pour in the sponge batter. Bake for 40 minutes, or until just firm to the touch. Meanwhile, make both the topping and the extra sauce by heating the ingredients gently in separate pans, whisking regularly, until they briefly boil. Pour the topping over the cooked pudding. Place the sticky toffee pudding under a moderate grill until bubbling. 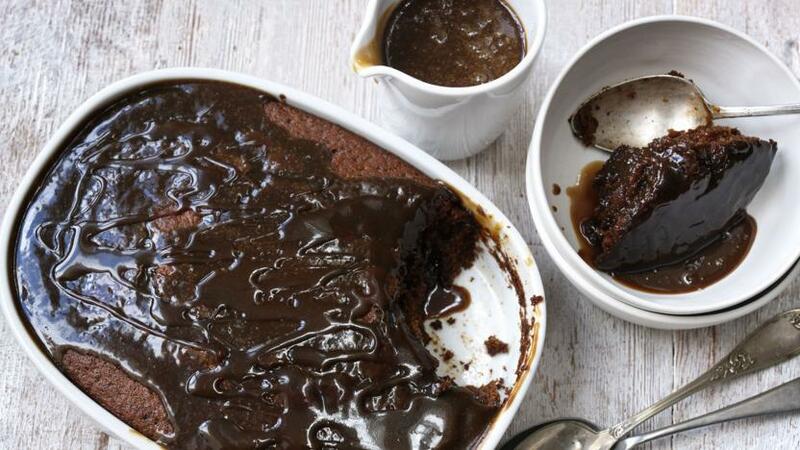 To serve, spoon the pudding into individual bowls and pour around the extra sauce.